To Our U.S. Military Members! This was on Yahoo this evening. What's that old saying about putting all your eggs in one basket? What God says is best, is best, though all the men in the world are against it. More troubles for the F-35. May be time to scrap the whole program and restart the upgraded F-15 and F-16 assembly lines. And maybe, but not sure, the F-22 assembly lines. The reason we Irish so often fight amongst ourselves is that we are always assured of having a worthy opponent. Hell, we need more F-22s just because of how the Russians are exporting Super Flankers to anyone with an interest and cash money--remember, Flanker was designed to first and foremost kill F-15s, and F-22's first mission is to be a distributor of Flanker parts across the landscape below? "Arguing with a Liberal is like playing chess with a pigeon: no matter how good you are, they're just going to crap all over the board, knock over all the pieces and strut around like they won." M. Ross sent this to me. It is part of an interview that was on CBC (Canadian Broadcasting Corporation). Some of the best arguments about the F-35 that I have heard. He seems to sugar coat the F35's failings. Ha! I read this story and wonder what other "limitations" the F-35 Flying Lemon may have. Why did they build a fighter with fuel temperature restrictions that other planes don't seem to have? Seems to me the bird will be more useless if it can't handle the heat of many places it could be sent. I wonder if they can use cold fuel, like at Minot or other Northern Tier bases? "​Airmen at Luke AFB, Ariz., home to future F-35A strike fighter training, are testing a fuel truck with a white-painted, reflective tank scheme to reduce solar heating and keep fuel temperatures within the F-35's tolerated heat range. The F-35 "may not function properly if the fuel temperature is too high, so after collaborating with other bases and receiving waiver approval from [Air Education and Training Command], we painted the tanks white," said SrA. Jacob Hartman, a fueler with the 56th Logistics Readiness Squadron, in Luke's Dec. 5 release. "This is the short-term goal. … The long-term fix is to have parking shades for the refuelers," added CMSgt. Ralph Resch, 56th LRS fuels manager. Luke airmen are also testing tankers painted in the traditional green color, simply coated with a solar reflective coating to better camouflage combat-deployed vehicles. "We will then compare temperatures between the green and white trucks" to gauge whether the reflective coating provides equal cooling, said MSgt. Joseph Maurin, 56th LRS fuel distribution noncommissioned officer in charge." VERY interested to know the results of the temp test with the white vs. green trucks. Also interested in knowing how the temp is controlled in the aircraft tanks. Same, or similar coating on the F-35 is what I am guessing, so I'm betting the actual color does not matter as they said in the article. Knowing how today's media works and the many idiots we have out there reporting it who have ulterior motives, I honestly believe this all needs to be looked at with a wider eye. But, here are also some words from someone directly involved hands-on with the program. So who dow e believe? I tend to give more credence to my AD USAF brother on the ground getting his hands dirty whether that be turning wrenches, QA'ing, testing, whatever. From an active duty Air Force member at Eglin working in the JSF program. "This is only for the early variants. We at Eglin don't have to use chilled fuel. As the aircraft matures, so does the thermal management. This was used on earlier models to help with avionics cooling. Not a factor for the active birds. Don't believe everything you read. As far as the engine issues, that was a one time occurrence due to a faulty batch of medal. Pratt has since launched a law suit against the vendor and has pursued other avenues to correct the issue. This plane is still in test phases and will have hiccups. All the great fighters went thru the same issues. Look at the F16's test flight with fly by wire and the disasters that occurred. Luckily we haven't lost a bird yet, which is a better track record than most test birds." Of course, just about anyone is going to defend his job position. Needs bread & butter to take care of himself and family. I believe the bird is too complex. Going to be a maintenance nightmare for years. Buddy, can you spare a tape measure? Actually this particular line caught my eye. "Overall, the Air Force plans to buy 1,763 JSF F-35A multi-role fighters." Anyone want to start a pool on what the actual number will be? With the possible exception of the P-51,What really good air craft have we ever had that did not have a period of growth and problems? The B-29 never got through the engine fire problem until the B-50 version. The P-38 was years behind before it matured. While it is still my favorite air plane ,in its early life the F-106 took an astronomical number of man hours to get a flying hour. The B-52 and C-135 a couple of the longest living war birds have suffered wing cracks and many other growth problems. A lot of people screamed we did not need the F-15 and F-16 because we had a proven dog of the F-4. The F-35 is a lot louder than the F-15 and F-16 but not near as loud an the Century series especially the F-105 with water. F-35's, F-15's and F-16's fly over my place daily. Dartfart, the Mustang was no exception to the "lots of teething pains" syndrome". When it first flew, it was a certifiable DOG. The Allison 1710 engine was not what the doctor ordered, and the Brits, who ordered the Mustang, used it for low altitude strafing and other stuff. It had a three-bladed prop, and was just not up to snuff. North American installed a Packard, licensed Rolls-Royce Merling, 1650 CI mill in it, with a 4 blade fan and it did wonders. But, when I worked on them in 1953, they were still a beast to work on. The cooling radiator was behind the cockpit, the scoop under the fuselage fed it air, and if it overheated, it meant taking the belly of the bird apart to replace the radiator. The oil cooler was under the cockpit and it too was a devil to get to, as well as constantly leaking oil, making the bottom of the bird look like the floor of a grease pit. The Old Sarge can tell you about flying them, but they had a really heavy torque roll on takeoff. The B-29 was never fixed. When I was at the SCAB, beginning in November 1952, it was common for the B-29s assigned to the SCAB seemed to always land with only three turning and one feathered. So, yes, I think every plane has had a fair amount of teething, and some, like the Mustang and the B-29, never got completely over them. Nor will the F-35 and whatever else comes along. Hell, we even said the C-130 was a "three-engine plane with a spare." I lost track of how many times I had to shut an engine down in flight. This was about 15 minutes after takeoff from Pope AFB, NC in January, 2010 as we were heading down to Haiti. Just shut her down, turned around, and flew back to Pope. And, the replacement for the A-10 Warthog is? ? Approaching Four Hundred Billion Dollars, and it still won't do the job. Maybe it is time to forget it and cut further losses. For the money it will cost to get the fleet of them up and flying, we could build some planes that will do the job and last for many years. Restart the F-22 assembly line. 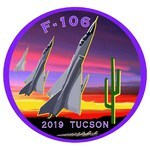 Buy the updated F-15 Boeing has built and is testing. Anything to quit wasting more money on the F-35. Things are heating up in the F-35, A-10 debate. Former A-10 pilot, and present U.S. Rep. Martha McSally, Republican representing Arizona's Second District, is putting the heat on the Puzzle Palace. It ain't over until the Fat Lady sings, and she isn't even warming up. NOTE: 256 charactor typing limit in a Shout. Press Enter or click the Send button to post your shout. Copyright © www.F-106DeltaDart.com. All Rights Reserved.